Is Medicare Spending the Biggest Driver of the Deficit? Up until about 1970, the government more or less balanced its budget. There were surplus years and deficit years, but on average, the government ran a surplus of about $2 billion over the period 1929 through 1969. 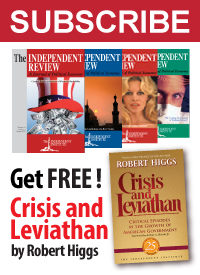 Starting in 1970, the government began to run sustained deficits, and by 1982, the government had spent a cumulative total of about $80 billion in excess of revenues received since 1929. At this point, what was essentially a flat line accelerates into what looks like exponential growth in debt. The deficit really starts to go off the cliff in 2008 with a $600 billion deficit, and the government outspends its revenues in excess of $1 trillion in each of the final three years of data. So where is this deficit and debt coming from? Is it entirely due to the fact that the government provided a fiscal stimulus, or perhaps due to the bailout of the banking system? Do we have a deficit because income tax revenues are too low? Is there a mass of wasteful spending, or is the government spending too much on defense? While all of these sources may contribute to the deficit, and our resulting national debt, they miss the elephant in the room. The main contribution to the deficit is that how much we pay into government social insurance programs is disconnected from how much the government pays back to us. In particular, we contribute far less into social insurance for health care than the government pays out. Figure 2 shows the difference between government receipts for Medicare and the amount paid out for Medicare and Medicaid.2 Just like the debt and deficit depicted in Figure 1, spending on medical care in excess of revenues shows exponential growth. In 2011, Medicare and Medicaid payments totaled $949 billion, while receipts for Medicare totaled $174 billion. This means that government spending on medical expenditures outstripped revenues by $775 billion, which represents 58% of the 2011 Federal deficit. Other revenue and spending mismatches account for the remaining 42%, but the medical expenditure mismatch is the overwhelming source of the Federal government’s deficit. As a thought experiment, let’s suppose that medical expenditures had been self-financed since the inception of government health care in the 1960s. What would our debt and deficit look like today? 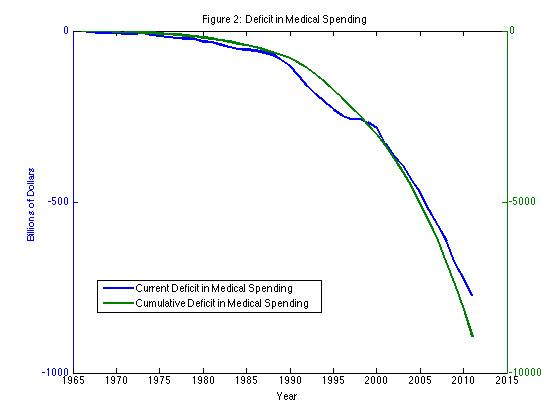 To answer this question, I simply added the medical care expenditure deficit back into the total government deficit. The result is depicted in Figure 3 and is astounding (at least to me). Outside of medical expenditures and revenues, the Federal government sometimes ran a surplus and sometimes ran a deficit from 1966 until 1980. 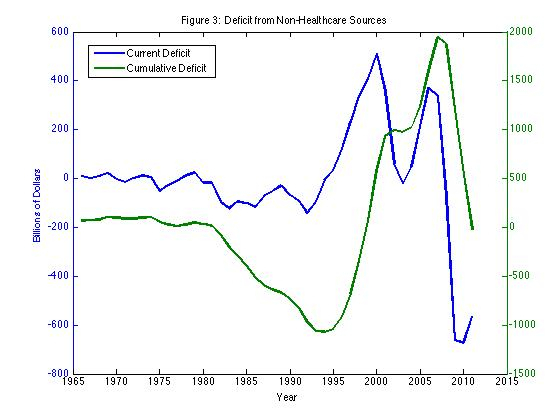 Starting in 1980, and lasting until 1994, the government consistently ran a deficit outside of medical spending, but from 1995 until 2010, it consistently ran a surplus. In 1994, the cumulative excess spending would have reached a bit over $1 trillion. But by 1999, debt due to sources other than medical spending would have been completely eliminated by surpluses! The government wouldn’t have needed to borrow again until 2011. If only Medicare spending had been better matched with the tax dollars collected to support it, we might not have anywhere near today’s $16,000,000,000,000+ ($16 trillion) national debt! HT: John Goodman, whose book Priceless: Curing the Healthcare Crisis is one of the best on the topic, anywhere!